Japanese girls have many charming and attractive points, but clear and direct communication is not usually one of them. Japanese girls can be a puzzle to read, especially on a first date. It is unusual in Japanese culture to express strong dislike or dissatisfaction to people and this is even more often the case with people you don’t know very well. If a first date goes well, you will be tempted to go on a second one straight away, but you don’t want to get your ego bruised with a rejection, so here are some valuable insights into the dating behaviors of Japanese girls. These insights can help you hone your strategy for dating Japanese girls and learn better how to read the signs before you make your next move. As you might already have noticed from reading about the do’s and don’ts for a great first date, or from personal experience, holding hands is a big deal for Japanese girls. Its importance can’t be overestimated, and it is the single clearest sign that things are going well. I’ve scoured the Internet and read up on the dating advice given to both Japanese men and Japanese women and they all make one thing very clear: pay attention to the hands. This means that before your date you will want to manicure or at least cut your nails, scrub under those fingernails and moisturize your hands. It might seem a bit extreme, but Japanese girls really do put a lot of stock in the handholding experience. They also care about your overall appearance so make sure you double check yourself in the mirror before you head out. This graphic from a Japanese dating advice website describes the results from a survey of both men and women. They were asked about their first date experiences. The question asked here is whether or not they held hands on their first date. This is the most important experience that can happen on a first date according to Japanese dating advice websites. The results were that 55% of men reached out to hold the hand of their date. 63% of girls were waiting for their date to hold their hand while only 13% of Japanese girls reached out to hold the hand of their date. This means that if you get a chance, make your move and hold her hand. Don’t wait around for her to do it. If she does reach for your hand, don’t miss your chance either. If you want to open the window for intimacy to develop on your first date it is a good idea to plan to go somewhere that holding hands could come naturally. There are a lot of great places that you can go on a first date. A walk in the park is an ideal chance to hold hands and build some intimacy Japanese style. It isn’t likely that you are going to kiss or go any further than holding hands on your first date so really focus on this clear sign of attraction to seal the deal and move on to second date territory where more things might be possible. Another clear sign that your date is going well is if you can make her laugh. Japanese dating advice sites advise girls to look out for this as a sign of a good partner. So if you manage to get a laugh or two out of your date you are going to make a good impression. There are lots of ways to make her laugh. It might be a good idea to do something new that neither one of you have done to create some ridiculous situations. You could go ice skating for example. It is important not to confuse laughing with giggling, though. 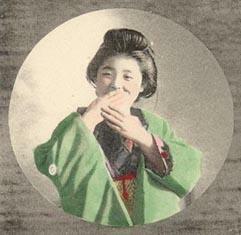 Japanese girls are likely to giggle a lot, but this can often be a sign of shyness. Bring out your inner comic, but don’t take it too far. Giving yourself a chance to look silly can be really attractive to Japanese girls. With cultures so far apart there are bound to be a few differences in communication style that could lead to some unexpected situations. One of these differences is body language. For instance, Japanese girls often cover their mouth when they eat or laugh. This is considered to be more polite. Of course, if this isn’t natural for you, you don’t have to, but don’t be surprised if she does. Japanese girls also don’t really like to suntan and so if it is a very sunny day she might even bring an umbrella for shade. Don’t be surprised if this happens, and in fact, you could use it to your advantage by offering to hold it for her and show her your true gentlemanly skills. Japanese girls love to take pictures. If you get a chance to visit somewhere beautiful on your date you should capture the moment with a quick snapshot or ‘selfie.’ This will show your date that you are having a good time and that you want to remember this moment. For Japanese girls, nothing is more romantic than the twinkling lights of the city at night. This is the perfect place to end your date and take a picture together. If she takes a picture of you two together it is a very good sign. First dates are never easy, and you are never sure quite what to expect. Reading up on the different types of situations that can occur between the two of you can help to prepare for the worst and even give you some tips to avoid an uncomfortable situation. This is the real deal the following advice comes straight from Japanese dating sites that real Japanese girls read to prepare for their dates. According to some Japanese dating advice sites, there are a number of different situations that might occur during a date that you should be prepared for. You both like each other and the chemistry is there. You have good feelings with each other and the conversation is natural. If you get close you don’t feel any strangeness or awkwardness. This date is going well and there is a good chance you might end up dating. There is also a good chance that you held hands together and had a nice time. You have a positive memory of this date. You enjoy each other’s company, the conversation is smooth and your interests line-up. These are all good signs right. But sometimes, that love connection just isn’t there. You should be prepared for a date that might end up like this. Sometimes there isn’t anything you can do, but sometimes there are some tips to plan and prepare you date carefully to push that friendship over the edge and turn it into a dating relationship. Once again, handholding is given as the clear way to tell the difference between a romantic date and one that is heading into friendship territory. The advice given to the Japanese girls going on dates is to try holding hands and if you think that maybe his hand is too big, for example, or something doesn’t feel right then to break off the handholding and go for friendship instead. So guys, I guess the best advice I can give here is to make sure you wash and moisturize those hands and take care to make sure they are ready for the big handhold moment. No pressure! There is nothing to be done. Something about this person just doesn’t work for you. It might be the way that they talk, or something about there personality, whatever it is, they aren’t the right match for you. Whatever happens, don’t go back to his house. Japanese girls don’t want to be thought of as easy catches, so they aren’t going to go home with a guy on a first date and just asking will probably be enough to ruin your chances for a second date. The graph below comes from more research about first dates on Japanese dating sites. The chart shows that 34% of people held hands on their first date while 32% only had a conversation with nothing more. 21% of the first dates ended in a kiss, while only 13% went any further. This is just a reminder that the first date can be relatively innocent by Western standards when you are dating a Japanese girl. If the date goes well you both had a really great time. But how do you know if she wants to see you again? A direct and honest expression is the clearest sign that she has really opened up to you. If she says something like “I really enjoyed myself” today, go ahead and congratulate yourself on a job well done, she really means it.